Tomorrow is Neptunalia, the Roman festival of Neptune, God of the Sea, according to the online Pagan Calendar. Very little is known about this ancient festival, except that it was honoured in the heat of the summer on July 23. Romans probably feasted, drank and generally had a bit of a party in honour of the God of Waters. I expect they also enjoyed a day out at the seaside when the weather was hot and the sun was shining - much as we do today. If you are at the coast this weekend, think of Neptune, raise a toast to the God of the Sea and celebrate Neptunalia however you fancy! 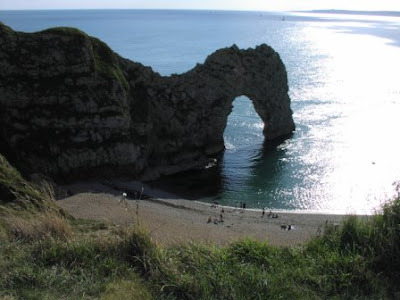 The photo was taken at Lulworth Cove, in Dorset. Ironically I had planned a day at the water park tomorrow. How odd... When I think of Neptune, I recall back to Aug. 25th, 1989 when I stood in the Blue Room at JPL and watched Voyager 2's fly-by of the large, blue gas giant. Now I have a holiday to celebrate that experience!! !